Don’t Fall Prey To Wood Flooring Gaps During Winter! Wood floors tend to dry out and even contract during the winter. This shrinking action is brought about by changes in the moisture content in the air. Low relative humidity (RH) or low moisture content in the surrounding air is what causes the wood to lose moisture thus causing the shrinkage. To avoid wood flooring shrinkage during winter, here are the most effective ways to make sure you have full control over your beautiful wooden floors and thus keep your floors free from gaps or cracks. 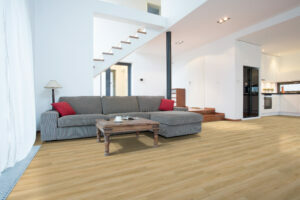 Engineered flooring is a great solution to floor problems during the winter season. Engineered flooring provides a more firm flooring structure than solid wood. While keeping that in mind, it’s important to remember that there are certain relative humidity (RH) specifications to look out for when choosing to go with engineered flooring. Most manufacturers provide specifications and the range of relative humidity (RH) in their products in order to guide the customer on how to maintain the floor material. For this type of floor, the warranty specifications usually range from 35 to 60 percent RH as the recommended range. Be sure to stay within the recommended RH range when using engineered flooring, to ensure the best maintenance for your floor during winter. You can always pick your choice of wooden planks when it comes to hardwood floors in Toronto. You can either go with the narrow sized wood or the wide sized planks for your wood flooring needs. However, when it comes to reducing winter related wood shrinking, narrow boards tend to shrink less than wide ones under the same changes in moisture content. There are tree species more dimensionally stable and stronger than others. For a certain change in moisture content, a six-inch-wide piece of hickory wood is going to shrink more than a six-inch-wide piece of red oak. In the case of reducing winter related wood flooring gaps, it is recommended to use species of tree that are much stronger and stable with a small dimensional change coefficient. Quarter-sawn wood planks also tend to shrink less than flat-sawn wood planks for the same amount of moisture change. In order to control your wood flooring and avoid too much gapping, quarter-sawn narrow boards from a strong stable species will be the best option. Addressing the moisture content in the air is another way of dealing with winter gapping. The gaps are formed when the wood dries up from the high moisture levels during the summer time. The way to reduce wood flooring shrinkage is to reduce the annual range in moisture content levels. To put it differently, in order to reduce winter floor gapping, do not allow your indoor relative humidity (RH) to drop to low levels. The best annual range for the optimum flooring performance is 20% RH from the wettest areas to the driest. As long as the RH is kept to a range that is not too wide, you floors will stay in good condition during the winter. There’s two ways to keep the winter indoor RH at the recommended levels. Reduce house ventilation: There’s a close relationship between moisture, RH and temperature. Because of this, the ventilation of a house during the winter season tends to dry out the moisture. When the cold winter air gets into the house and gets warmed up, the RH of that air drops to very low levels. This means that the more you introduce ventilated air into the house the more dry this air becomes, the more moisture you’ll need to add. This is where reducing ventilation comes in. Increasing the moisture: As mentioned earlier, if the ventilation is higher, you’ll need to add more moisture. The amount of moisture added depends on how cold or warm it is outside. Higher RH would also mean more amount of moisture as well. Now that you know the essentials about wood floor gaps during the winter season, you will know what to do so that you don’t have to deal with the unsightly wood flooring gaps!